Eight Maryland counties elect county executives. These powerful offices are the equivalent of being mayor of a city. Incumbents are seeking reelection in five counties. State’s Attorney Angela Alsobrooks is sure to win in Prince George’s where the Democratic nomination is tantamount to election. Baltimore County has quite the race between John Olszewski, Jr. and Al Redmer. Republicans think they have this one, partly due to the enormous margins Hogan is expected to rack up. But Olszewski has unified Democrats and is pulling out all the stops. Democrats think he’ll win this one. In Anne Arundel and Howard, Democrats are running unexpectedly lively challenges to two favored Republican incumbents. In Anne Arundel, development is a major issue, as are incumbent Steve Schuh’s occasional wanderings into more right-wing rhetoric on non-county issues. Allen Kittleman in Howard has a more moderate profile but faces a more Democratic electorate. Additionally, Howard has exactly the highly educated profile of places that are swinging hard to the Democrats this year. Despite challenges, both Anne Arundel and Howard lean Republican and it will an upset if Democrats win either. Based on past election statistics and the political leanings of each county, Schuh ought to be harder to defeat. But Kittleman has carefully tailored his profile to his county. Montgomery has more of a race than usual. Councilmember Floreen has abandoned the Democrats to run as an independent. Though she often voted with Elrich on the Council, Floreen argues that Marc Elrich is too hostile to business. Republicans are left with perennial candidate Robin Ficker. Elrich should win easily notwithstanding ongoing hostility from the Washington Post and their support for Floreen. Despite an influx of cash into Floreen’s campaign coffers, her campaign has just not been visible enough to make the case against Elrich needed in order to persuade the overwhelmingly Democratic electorate to defect to her in sufficient numbers. In contrast, Elrich has attacked Floreen as a tool of developer interests and maintained good pre-election contact with Democrats. As a former council president, Floreen represents the status quo in a year when voters seem ready for change. Even if Floreen does well in the less Democratic upcounty, she will still have to contend with the heavily Democratic crescent that contains far more voters. There are just too many loyal Democrats and not enough has been done to peel them off. Finally, portions of Floreen’s campaign seem designed to alienate Republicans and she needs their support. Floreen has repeatedly identified herself as lifelong Democrat and publicized photos with Hillary Clinton. Neither seem likely to woo Republicans. Since Republicans have shown themselves willing to reject Ficker, I’m not sure it was the best approach. I can’t say I know enough about the remaining races to make any strong predictions. 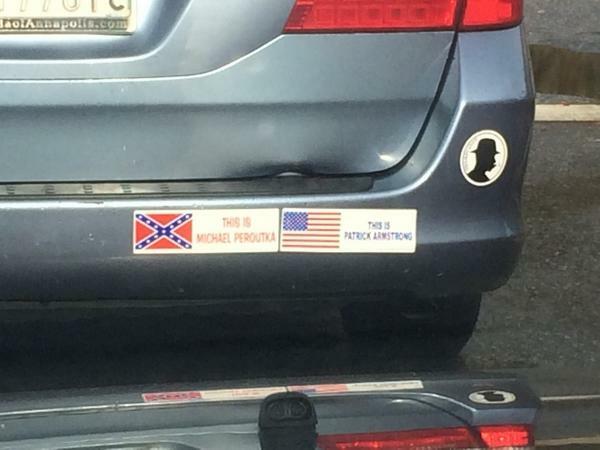 In Frederick, Del. Kathy Afzali is challenging incumbent County Exec. Jan Gardner in what I imagine is a hard fought race in this purple county. Harford and Wicomico are the sorts of places that tend to elect Republicans countywide. Now, I’m heading out to go vote. If you haven’t done the same, I encourage you to join me at the polls! The Statewide Republican bench for 2022 got a whole lot deeper on November 4th. Pro-Marriage Equality, Anti-Death Penalty former State Senator and Howard County Executive Alan Kittleman is a suburban moderate Republican of the northeastern breed that’s been dying out since the early 90’s–socially liberal and fiscal conservative with a patrician demeanor. Kittleman brings a growing base in Howard County to a statewide contest. The Lt Governor is supposedly an apolitical technocrat with no desire to run for office at the top of a ticket. But an apolitical technocrat who happens to be an African American from the Baltimore Suburbs with a certain affable charm could be a truly amazing statewide candidate. Food for thought. The new Harford County Executive is a talented fundraiser and represents a rapidly growing jurisdiction with around one-quarter million residents. He has an appealingly home spun way about him and Fallston is not a bad place to start raising money for Governor. If I were picking the Republican nominee for Governor, I’d go with the guy. Dartmouth undergrad. Harvard MBA. Masters in Education from Johns Hopkins. A former Senior Executive at two major investment banks. The incoming Chief Executive of one Maryland’s largest counties (Anne Arundel with nearly 700,000 residents). If that doesn’t spell gubernatorial contender, I don’t know what does. Now, the most interesting play might be if instead of these guys fighting it out in the primary, they formed a formidable statewide ticket. Boyd Rutherford would be a highly intriguing candidate for Comptroller, and Alan Kittleman would be a credible candidate for Attorney General. With Schuh at the top of the ticket and and Glassman as Lt Governor, I wouldn’t be surprised to see a statewide Republican sweep. 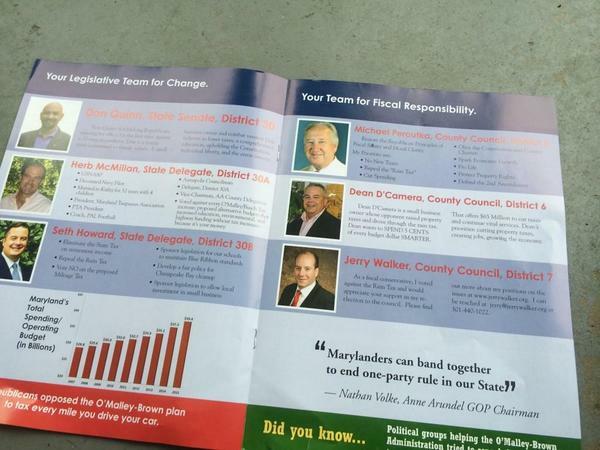 The worst thing for the Democratic establishment to happen on November 4th wasn’t Larry Hogan’s election as Governor. 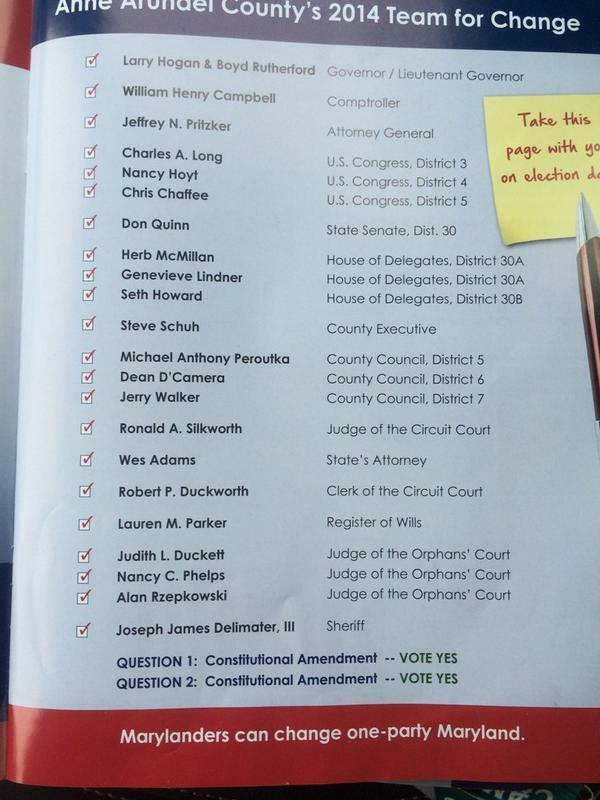 It was the fact that further down ballot, Republican’s now have a legitimate bench of candidates. First, the GOP operative who thought it was a great idea to link their gubernatorial and county exec candidates to this loser should be fired. Second, Hogan and Schuh should publicly endorse Armstrong at an event at this point to undo the damage. Remember this is a guy who said please rise for the national anthem before “Dixie” was played and advocates southern secession from the United States. As I said before, this is a chance for Democrats and Republicans to have a united purpose as we agree that politics is better off without Peroutka poison. Anne Arundel County Council Candidate Michael Peroutka was until recently the rare political bird who refused to talk to the media. When he finally did agree to talk to reporters, one cannot help but think that the original refusal was the better bet. Peroutka has been active in the John Birch Society but it is his current board membership on the League of the South that has attracted scrutiny. Labeled a hate group by the Southern Poverty Law Center, the League advocates secession from the U.S. Indeed, the video above shows Peroutka asking people to “stand for the national anthem” of Dixie–not the Star-Spangled Banner. The Baltimore Sun, which has done a fine job of covering Peroutka’s checkered past and current unacceptable views and thus been one of the many criticized by Peroutka, reports that he doesn’t think that was a mistake and refuses to leave the League. As a result, Republicans have started running for the hills. Gubernatorial Candidate Larry Hogan wisely didn’t wait to disassociate himself from Peroutka and his campaign says that Hogan “absolutely disavows” him. Peroutka now whines that Hogan didn’t “dialogue” with him. Unfortunately the State Republican Party has yet to back up their leading candidates and has made “no decision” on whether to back Peroutka. At this point, the GOP is late and needs to join Hogan and Schuh in this no-brainer decision if it doesn’t want to persuade more Marylanders that they are way out of the mainstream. He said people moving out of Anne Arundel County and the state of Maryland because of high taxes represent individual secession. Peroutka can continue to piss all over America to his heart’s content and his party’s heartburn but he could at least do us the courtesy of not calling it rain to borrow a phrase.